Call to request a FREE, no-obligation inspection, (available for most customers). Mitchell's Termite and Pest Control is committed to providing the best results you can get for insect and pest control in East Tennessee. No job is to big or to small. Our company is large enough to service every need, and small enough to care. 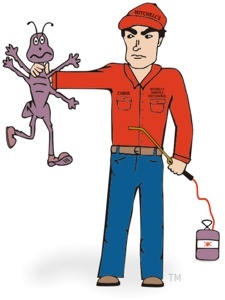 Got pests in your home? Give us a call! We will be happy to answer any questions you may have about our products or services. We are here to serve you! Mitchell's Termite and Pest Control technicians are your "Termidor® Certified Professionals"
Termites are in your nationhood. Is your home safe? Termites cause $5 billion worth of damage each year in the U.S. alone. Your home is a very valuable asset, and termites can cause thousands of dollars of damage to it. There can be millions of termites in a colony, but you may never see any evidence of them until a pest management professional discovers they've seriously damaged your home. For 100% termite protection, Mitchell's Termite and Pest Control uses Termidor®. Our technicians are Termidor certified professionals. With Termidor, America's #1 termite defense product, you can rest assured you've made the best choice possible for your home. Anderson, Campbell, Scott, Blount, Claiborne, Grainger, Hamblen, Jefferson, Knox, Loudon, Morgan, Roane, Sevier, and Union Counties... Knoxville TN, Huntsville TN, Jacksboro TN, Clinton TN, Maynardville TN, Tazewell TN, Rutledge TN, Morristown TN, Dandridge TN, Sevierville TN, Maryville TN, Lenoir City TN, Rockwood TN, and Oak Ridge TN. We accept: VISA, MASTER CARD, DISCOVER, Checks and Cash.